What makes our community so heartening is the energy and love you possess. For the past five years, we are extremely grateful to be the personal sanctuary for Upsiders from all walks of life: the executive, the chef, the air traffic controller, the dancer, the entrepreneur, the cancer-survivor, the homemaker, the new mom... Everyone steps inside our doors not only to tone and nourish the body but also to seek balance and joy in life. 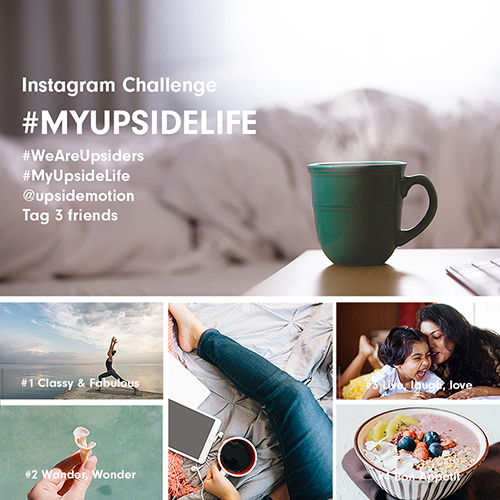 In this spirit, we'd love to invite you to share the most inspiring moments in your life with us in our #MyUpsideLife Instagram Challenge: whether you’re laughing with your loved ones, indulging in a bowl of acai, suntanning in Hawaii, rocking a new activewear look, or actually pulsing at the barre! Celebrating the Upside of Life with us & stand a chance to win amazing prizes! To submit an entry, simply share your Insta snaps in any one of the four themes, tag 3 friends & @upsidemotion, hashtag #MyUpsideLife and #WeAreUpsiders. Weekly winners to be announced every Monday of the following week.